On Sunday amid a crowd of snowencrusted supporters, the worst kept secret in Minnesota was revealed on Boom Island in Minneapolis. 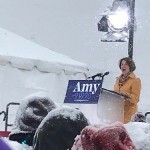 Senator Amy Klobuchar appeared before the crowd at a podium that seemed to be carved out of ice to announce her entrance into the 2020 Presidential race. A former employee of the Senator and current State Senator Karla Bigham provided this exclusive report from the event. Second Congressional District Representative Angie Craig has also formally endorsed Klobuchar. Tune in Wednesday to Session Update as we discus the announcement and other topics with Senator Bigham.